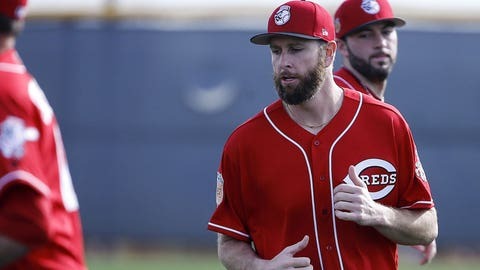 GOODYEAR, Ariz. (AP) — Scott Feldman won’t compete in the World Baseball Classic for Israel, choosing instead to get ready to fill a spot in the Cincinnati Reds’ rotation. Feldman said Tuesday that he has turned down the opportunity to pitch in the WBC. The Reds signed him on Jan. 26 to fill the spot that opened when they traded Dan Straily — their top starter last season — to the Marlins for prospects. The 34-year-old Feldman will get $2.3 million on his one-year deal and can make an additional $2.2 million in bonuses based upon starts and $1.5 million for relief appearances, depending upon which role he fills. The Reds need for a starter became more acute when Homer Bailey had surgery to remove bone spurs from his pitching elbow, sidelining him into the season. The Reds opened last season with five starters on the disabled list, putting pressure on a bullpen that wound up being historically bad. They signed closer Drew Storen in the offseason to try to fix that issue. Feldman has pitched for the Rangers, Cubs, Orioles, Astros and Blue Jays. He was used mostly in relief last season, making only five starts, but is getting ready to return to a starting role. “Starting is something I’d like to do,” he said. NOTES: The Reds put Bailey on the 60-day disabled list on Tuesday. He had surgery to repair a torn tendon in his right forearm in 2014 and had Tommy John surgery the following year. He was limited to six starts last season because of setbacks during his rehabilitation. Bailey is expected to miss at least the first month of the season because of the elbow surgery. … The Reds claimed right-hander Nefi Ogando off waivers from the Pirates. Ogando made 18 relief appearances the last two seasons for the Phillies and Marlins.